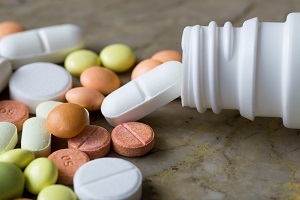 Could Your Medication Be Affecting Your Voice? Some medications including prescription, over-the-counter, and herbal supplements can affect the function of your voice. If your doctor prescribes a medication that adversely affects your voice, make sure the benefit of taking the medicine outweighs the problems with your voice. Most medications affect the voice by drying out the protective mucosal layer covering the vocal cords. Vocal cords must be well-lubricated to operate properly; if the mucosa becomes dry, speech will be more difficult. This is why hydration is an important component of vocal health. Oral contraceptives may cause fluid retention (edema) in the vocal cords because they contain estrogen. Estrogen replacement therapy post-menopause may have a variable effect. NOTE: Contents of this fact sheet are based on information provided by The Center for Voice at Northwestern University.